Simple. Personal. Trustworthy. These are the enduring hallmarks of print advertising. And based on the trends showing up, print marketing will remain a dependable and highly effective way to boost your business for years to come. Digital media is bristling with activity that is growing exponentially. If your business doesn’t keep up on the trends, your signal can get lost in all the noise. It’s important to take advantage of every marketing medium available, and -in spite of arguments regarding its demise- print advertising does more than merely endure. It remains a major player. 82 percent of internet users in the United States trust print advertising more than digital marketing, according to marketing research institute Marketing Sherpa. The simplicity of being able to reach out and touch something is comforting and feels all the more solid in this digital, virtual reality age of advertising. Having something tangible at hand continues to be a dependable way to build credibility for your brand with your target audience. In fact, over the past few years, print advertising has been enjoying a real renaissance. 2017 saw print marketing flyers each past $15 billion in the United States, according to Statista. Projections predict the impact of print advertising to go through the roof when the final numbers come in for 2018. There is little doubt, when you look at such stats, that print advertising communicates an authenticity that digital marketing can’t offer. There’s a reason the old saying “less is more” has never faded. And it is as true an axiom in print advertising today as ever; more so, actually, in this era of digital chaos. There is a yearning among consumers for a return to honesty and simplicity. A minimalist approach wins the day. Print advertising that conveys clear, to-the-point elegance and purpose cuts through the fog of digital overload like a scalpel. So keep the imagery and text brief and on target. Take advantage of white space in your layout so you can showcase your product or service’s authenticity. Print advertising is by nature a highly personal medium. Today, the personal side of it can be developed to more meaningful levels than ever. Your business can have customized posters, highly targeted flyers, and direct mailings created that leap over your competition. You already have an online presence, right? That means you have at your disposal analytics about your customers’ preferences. Apply that to your print marketing to take the personal touch to the max. Naturally, you aren’t going to abandon your digital marketing methods. That’s not the point at all to this article. Rather, you should turn your digital and print marketing campaigns into the perfect partnership. Print advertising and digital marketing aren’t mutually exclusive. In fact, well into the thick of our information age, these two media should be parts of a whole, working in concert to boost sales and revenue. Any modern marketing agency worth its salt knows that digital and print marketing go hand-in-hand to develop the most innovative campaigns in today’s advertising trends. Include QR codes in your print marketing. QR stands for “quick response.” A QR code works very much like barcodes, but in the case of QRs, they generally lead to a web page. QRs are a must-have in your hybrid marketing, so you’ll want to include them in all your print advertising. Consumers can scan the code with their phones or other mobile devices. This allows them to go directly to a landing page that allows them to order a product or service, enjoy freebies, or get more detailed information about your brand. QR codes turn your print advertising into a gateway to your website or social media pages. Since QRs are scan-able, they are more consumer friendly than the traditional method of providing links on posters or flyers. So utilizing QR codes help builds a brand engagement network that takes advantage of both online and offline marketing. QR codes can be used for much more than website links. They can send consumers to videos, free downloads, complimentary wifi access, gaming, questionnaires, real-time map directions, and more. Coupons have long been a staple of print advertising, but a unique coupon code updates that classic model. A unique coupon code (a.k.a. unique promo code) is a computer-generated code that an interested consumer can enter into a specially designated box on the shopping cart page of a business’s website. Unique coupon codes are more targeted than generic ones, making customers feel valued on an individual level. They can be used to take advantage of discounts or free gifts or/and product trials. This makes unique promo codes a great print advertising technique that attracts new customers or rewards long-standing ones. Just about any way a business chooses to use these unique codes, the result is a boost in sales. Trends indicate that 2018 will see a rise in consumer use of coupon codes. 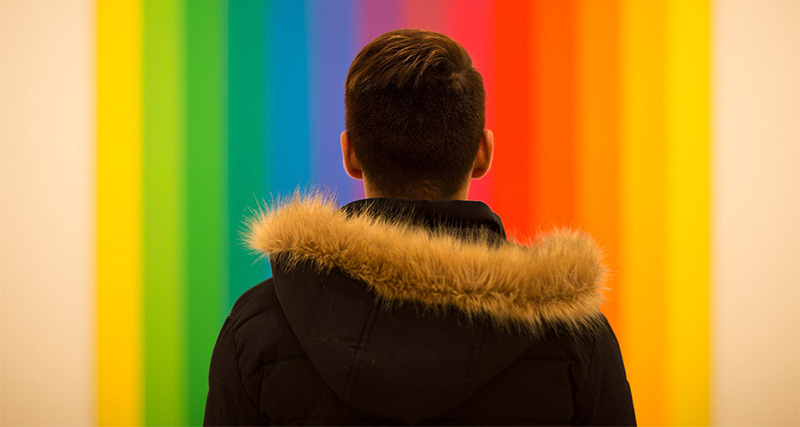 Color is critical in print advertising. It has the power to make or break a good print marketing design. It even holds sway over the customer’s mood! Color will always remain essential when setting the mood of your print advertising campaign. So remember: choose your print marketing’s color, change your customer’s mood. Tactile sensation has been shown to be one of the strongest impactors on memory. It is so influential that this type of memory has a name: haptic. When someone holds an object, it evokes a deep-level sensation. We identify different textures with quality, pleasure, revulsion, and more. Tapping into haptic memory can greatly enhance lasting brand awareness. So never discount the importance of producing print advertising that is a pleasure to the touch and evokes quality. Potential customers are far more likely to keep flyers, business cards, and postcards that have a unique texture. Explore the value of embossed or debossed, raised ink or finely detailed folds, and quality paper stock. 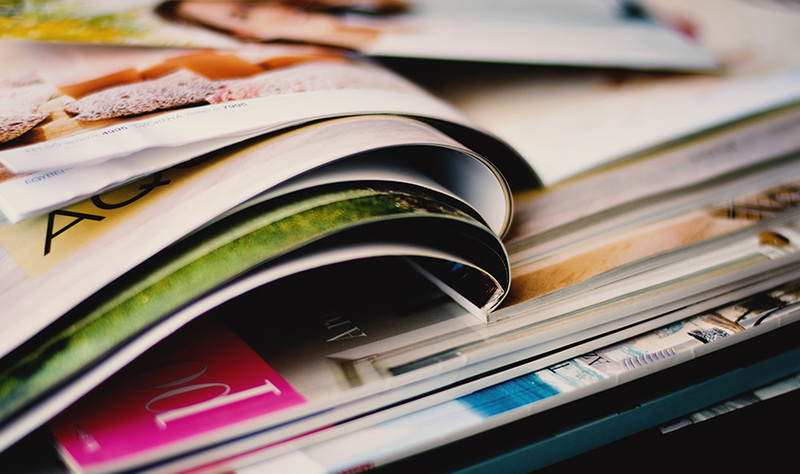 Wondering if your print advertising should be matte or glossy? 2018 trends indicate matte is the way to go. Soft-touch texture on printed materials also takes advantage of the sub-liminal haptic response and gives the customer a feeling of elegance and contemporary styling. You will notice that everything packaged by “Apple” is done so with a “soft-touch” treatment. For a large part of the population, “shiny” is their favorite color. Very few people aren’t attracted to shiny things. How can we not be? Shiny is naturally eye-catching and attention-grabbing. So consider foil stamping when working on your print advertising. Foil stamping can take many forms. It can be fluorescent or more subdued, clear and translucent, create dull gloss sheen, or even create a holographic appearance. Foil stamping works best on simple designs with thicker lines. This is particularly true when you want the print advertising to have a reflective effect on its design. And there’s one more advantage to foil stamping. It’s durable and makes your posters, flyers, postcards, and business cards last longer. That means the impact of your print advertising will be in front of consumers longer, too. Spot varnish is a variation on the natural appeal of shiny. It’s more subtle and is best used as an emphasis to a particular part of your print advertising design. Spot varnishing adds depth, vibrancy, and gloss to an image, logo, or brand image. The effect of spot varnish comes very close to 3D. That means logos and images practically jump off the background. Want to stand out at a trade show? Adding spot varnish to print advertising that has strong texture can literally stop consumers in their tracks! To make the best of your print advertising campaign, think of print marketing as the perfect marriage of skill and art., and positive and negative space. Consider this: some of the most compelling print advertising in history has graduated to full-on art status, with posters being framed and displayed in homes and businesses. Part of what makes print advertising rise to the level of artisanal is compelling storytelling. To attract consumers today, your posters, print ads, and flyers must do more than shout out a standard call to action or list out information about the product or brand. Today, you need to turn these elements into a story. Your brand’s story. Storytelling has become an important print marketing trend In 2018. Storytelling encompasses strong, intriguing images as well as talented copy and ad writing. It creates a narrative about your brand; perhaps your company’s ethos, history, even your business’s future. Or maybe you take the narrative in another direction, telling the story of your latest product or service. Regardless of the approach, excellent storytelling in print advertising pulls together the most compelling image or images, creative copywriting, and the right colors and textures to set the mood and tone of your business, product, and ad campaign. Doesn’t everybody enjoy and remember a good story? Just as with visual and haptic memory, great storytelling is an integral part of successful advertising. Getting it right means your ROI in print advertising is maximized. You’ll see it in stark black and white on your business’s bottom line. Print advertising shouldn’t be an afterthought. It is as relevant today for businesses as its online cousin. In fact, the best ad campaigns combine online marketing with print advertising to provide a one-two punch of revenue increase. Print advertising is actually on the rise. This is because it satisfies the senses, creates a sense of trust and stability, and has proven its worth time and again in producing outstanding ROI. But with a more savvy consumer base comes the need to up your print marketing game from decades past. Today’s successful print marketing is elegantly simple, targeted and personal, visually compelling, texture-rich, and creatively written. And well, well worth the effort. So get out there, catch your target audience’s attention, and tell your story!